Established on 5 October 2000 in Jakarta - Indonesia, Arita serves as a company specialized in import, distribution, and services for valves, fittings, instrumentations, and control. 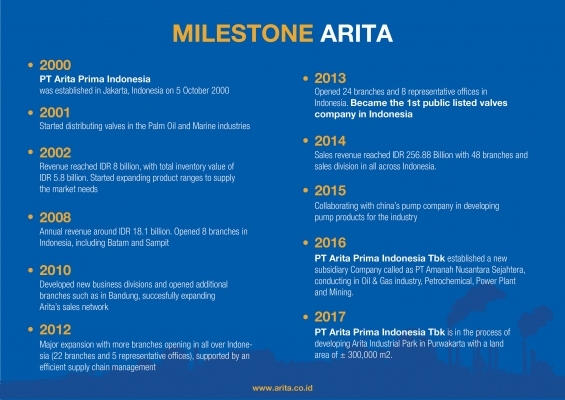 As a result of the great performance in the industry, Arita successfully became the first and only public listed valves company in Indonesia since 2013. Arita’s wide range of international network made it to become the industrial leader. Arita is the bridge for Indonesian customers to get high quality products by international brands from all over the world including JF Arita, Bells, Q-Flex, Clorius, Ari Armaturen, Thermo, ANS and many more to come. Entering 17 years in Indonesian valves industry, Arita has been supplying products to several industries including Oil and Gas, Palm Oil, Marine, Waterwork, Petrochemical, Oleochemical, Building, Mining, Power Plant, and Geothermal. In order to support the distribution system and to reach the customers more easily, Arita opened 34 branches and 12 sales divisions which are located strategically in Indonesia’s biggest cities and regions. To be the pioneer of the industry providing excellent products, services & solutions to create a better future for the society. Achievement, every employee in the company must create work vision and target for themselves, has a clear plan to achieve it and work the plan whole heartedly with great responsibility. Responsiveness, every employee in the company should always do corrective and improvement actions continuously, always think and apply innovative yet creative efforts in order to adapt to the changing environment. Integrity, every employee in the company must uphold honesty, have responsibility in doing each work roles and tasks. Moreover, having a loyal nature to the company is also a must. Teamwork, every employee in the company should listen to every suggestions and feedbacks regarding their work performance for their own self-improvement, and should never hesitate to help other co-workers who needs support. Accountable, every employee in the company should stay committed to implement the rules and regulations of the company, manage the work administration and documentation neatly, and always ready to be evaluated for their work performance.